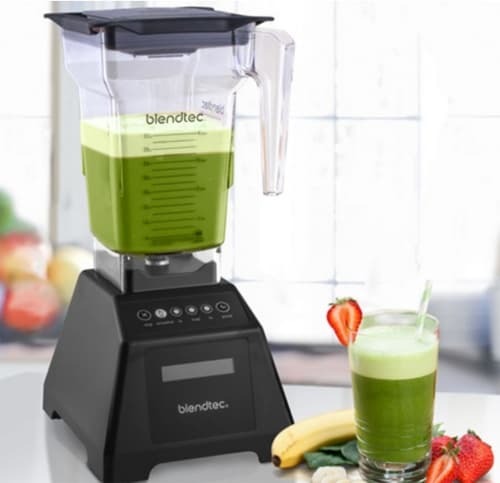 Many people ended up finding out about Blendtec through its YouTube channel’s Will It Blend? series. This series features Blendtec’s inventor, Tom Dickson, attempting to blend various objects like a baseball or an iPhone. While more entertainment than anything else, these videos piqued interest in how powerful the Blendtec blenders are. The videos may be fun to make but Dickson certainly stumbled on a successful way of marketing his products. Dickson eventually wanted to create a blender that resembled commercial models but were scaled down for use at home. Through numerous experiments he finally created one of the most popular “high end” blenders today, the Blendtec Classic 475. It is a more affordable model that will still blow other typical blenders out of the water. At least that’s the selling point! If you are someone that drinks a lot of smoothies, shakes or liquid/pureed foods like soups, the Classic 475 is perfect for daily use. Even passionate home chefs will enjoy how they can use this blender in place of a food processor. Even though the Classic 475 doesn’t have as many features as some of Blendtec’s other blenders, it still have plenty going for it. At first glance it may look like a heavier duty version of any other blender but don’t be fooled. There are a few key difference that put this model on a different level. The Blendtec Classic 475 is more of a classic blender, as the name suggests. For all-around kitchen use, the 475 model is perfect. It is straightforward in how it can be used and the Blending 101 guide book with help you in the beginning. The fact that is comes with a recipe book is especially helpful for new users to understand some of the versatile ways they can use their new blender. The Blendtec 475 is a really popular blender for many reasons. You can find numerous reviews showing just how awesome these machines are and websites dedicated to recipes you can make in them. Here are three reasons why the Classic 475 is a favorite. The first thing you’re going to notice about the Blendtec 475 is how powerful it is compared to a normal household blender. While normal blenders can struggle with ice or frozen fruit, this one will chop right through it without a problem. Users find that they can finally make those super thick milkshakes or even sorbets without having to resort to adding a bunch of extra liquid. This blender is powered by a 3HP motor which means it not only blends and purees ingredients easily but the motor is strong enough that it will maintain heat. For example, if you want to make a soup like a potato chowder, you could cook the ingredients and then add them to the blender to combine. The Blendtec will keep the soup warm so once it is ready, it really hasn’t suffered heat loss. You can literally pour the soup right into your bowl. Controlling the Blendtec 475 is easy. The panel has 6 buttons, which are smooth and easy to press. You have options for Smoothie and Pulse, as well as speed controls for Low, Medium and High. Of course there is also a Stop button, which will pause the blending. One really cool feature that may blenders don’t have it an illuminated display on the front. If you select the Smoothie button, for example, it will show you how much time blending time you have left. Finding a blender that can do so much is rare, but the Blendtec can really make anything a food processor could. The FourSide jar is extremely easy to clean compared to other blender jars. The sides and bottom are smooth, meaning you can usually just rinse the blender clean with water after making a smoothie. The smooth sides makes it hard even for thick sauces to stick to. It is recommended that when you wash this blender you use a gentle dishing washing soap and a sponge. A scouring pad will scratch the plastic so make sure you clean the jar right after you finish using it. Aside from the jar, the Blendtec really doesn’t need any maintenance. This blender was modeled after a commercial design, so the average home user won’t put it through anywhere as much as a restaurant would. This means this blender is going to last for many years without an issue. The 8 year warranty is excellent protection, though few end up having to use it. Many blenders come with a plunger-like tamper which you’ll use to push ingredients down into the blades, or use to move a chunk of frozen fruit that becomes trapped. There is nothing wrong with this design but one really nice thing about the Blendtec is that is function perfectly without the use of this tool. The pure power of the motor, shape of the blades and shape of the cup really helps to pull your ingredients right down to ensure even blending. If you’ve never used a professional-style blender, you’re going to be amazed at how impressive the Blendtec 475 is. This blender looks great and is so versatile that you’re going to find yourself looking for any excuse to blend or puree something. The Blendtec 475 is really a great blender. You can’t argue with how many 5 star reviews and numerous praises it has. However, when compared to other blenders there are two faults that can be found. The Blendtec 475 retails for about $275-300 from most stores at the time of this writing (check this listing for the latest live prices). There are certainly more expensive blenders on the market but compared to one that are most like the 475, this model is about $50 more expensive. The main competitor of Blendtec is Vitamix and you can purchase one of their blenders for less. With price aside there is also a concern about durability. There is no doubt that the Blendtec is tough and powerful but some owners with similar styles of blenders aren’t that impressed when compared. Again, Vitamix is often used in a comparison, and the Blendtec’s jar seems more apt to damage. There really aren’t many issues with the Blendtec 475 so if you really have your heart set on it, don’t let a comparison change your mind. This really is a high-quality, commerical or home blender than can handle almost anything you can throw at it. It was built to last for years and with how versatile it is, it truly is money well spent if you are someone that uses a blender often. Be sure to (check this listing for the latest live prices).